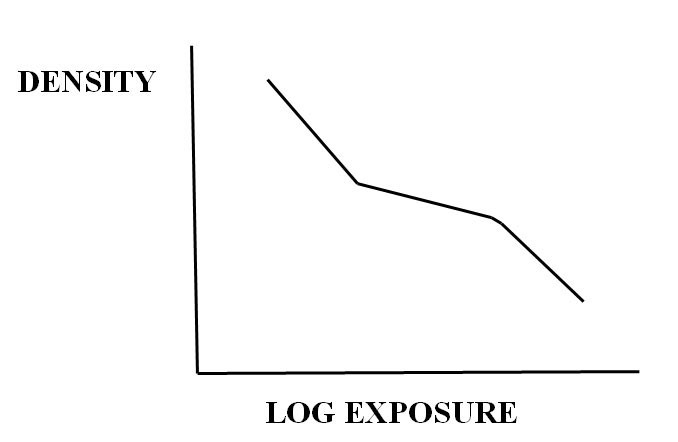 One of the last holdouts of analog photography is the black-and-white reversal process used to produce diapositives. It behooves experimenters of chemical based photography to examine this process in detail as source material for unique results - more specifically, as regards the bleaching agent employed to remove the initial negative image. In previous papers it was reported that with insufficient second exposures, reversal black-and-white processing produced diapositives with partial positive, partial negative equidensity images (Capstaff, Verkinderen, Yurow 2014).This phenomenon, known as re-reversal, can be traced to differential desensitization by the silver bleaching bath of remaining silver bromide used to produce the final positive image. With permanganate bleach, internal image desensitization is involved, while with dichromate, surface desensitization occurs. The result with these bleaches is that shadow areas appear as low density, with flat contrast, and are quite grainy. In addition, thin, dark contour lines appear at borders between shadows and either middle tones or highlights. In addition to permanganate and dichromate, a number of other bleach oxidizing agents, such as benzoquinone, cerate, and persulfate, have been reported for reversal procedures (Lumiere). In this paper, investigation was made of ceric sulfate, with regard to the phenomenon of re-reversal. As will be described below, the results obtained are novel. Background: Ceric ammonium sulfate (as an analytical oxidant) was first reported in 1861 by Lange (Kolthoff and Sandell). It is always used in strong acid solution, because ceric hydroxide is a weak base insoluble in water. 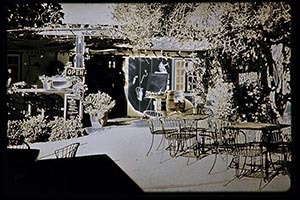 An early application of cerium in photography was for a cerate silver bleach around 1900 in reports by the Lumiere brothers and Seyewetz. Primarily employed for reduction of dense negatives and prints, photographers utilized a solution of ceric sulfate in sulfuric acid. The mixture was extolled by Marsh and by Lea, who indicated that the concentrated solution (10%) keeps indefinitely, is usually diluted 1:10 for use, and that reduction increases contrast, which is much greater in the shadows than in the denser part of the image. 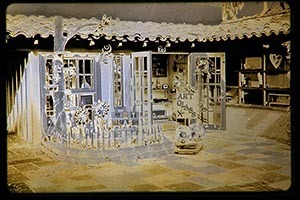 In 1929, Seyewetz suggested the use of ceric sulfate for film reversal in hot climates, because of the resulting hardening of gelatin in the bleach (Clerc). In this connection, tetravalent cerium is a known gelatin hardening agent (Mees). Also reported, because of its photosensitivity, cerate ion in gelatinized paper is reduced upon exposure to light under a positive to yield cerous ion. Treatment of the paper with an aromatic amine, such as aniline, in the presence of unreacted cerate, produces a colored dye (Jones). Additional references comment on the relatively slow reactivity of cerate when compared to permanganate and dichromate, although all three have similar high oxidation potentials (Salzberg, Mees). This factor is suspected in being significant in the unusual results obtained with ceric sulfate as described below. By way of explanation, Paulenova indicated that in dilute sulfuric acid, ceric ion is almost completely present as Ce(SO4)32- (the acid H2Ce(SO4)3 is orange), while colorless cerous ion is approximately half-complexed as Ce(SO4)+. Thus, the ceric ion is more strongly bonded to sulfate ion than is the cerous ion. Consequently, the ceric to cerous reaction is slow because of especially large structural changes associated with conversions between ionic sulfate complexes of the two species. In this connection, dissolving ceric sulfate in dilute sulfuric acid forms both H2Ce(SO4)3 (orange) and H4Ce(SO4)4 (English-red), which forms the commercial salt (NH4)4Ce(SO4)4 2H2O and a number of other ceric acids. Paulenova's solubility value for ceric sulfate tetrahydrate in 1M sulfuric acid at 20° C is 0.4M. Shibaoka and Hayashi described rapid reversal processing of microfilm with ceric sulfate bleach and trace amounts of aminothiol catalysts such as cysteine or thiourea, added to the first developer stop bath, because of the slow bleaching speed for silver of ceric sulfate alone. The authors also indicated that a cerium salt is a preferred bleaching agent for black and white films because it does not present pollution problems – i.e., is less harmful to animals and plants. Experimental: As indicated above, cerate compounds are considerably more expensive than are dichromate or permanganate salts. A recommended supplier is Antec Inc. in Louisville, Ky where anhydrous ceric sulfate (99%) is currently available at $65 for 100g including shipping. In all of the above, except for the dot etching solution, sulfuric acid is added to water prior to addition of the ceric salt, in order to prevent the precipitation of basic ceric sulfates. The preparation of the dot etching solution is rather unconventional (NIIR Board)! To 67g of anhydrous ceric sulfate in a beaker is added 28cc of concentrated sulfuric acid with thorough mixing, followed by 30cc of water (spattering!). The mixture is heated and more water added in small amounts until the solid is completely dissolved, and the orange yellow solution becomes clear. The mixture is then made up with water to 1000cc. In initial and all subsequent experiments, the author used a modified Glafkides formulation from the above Table, with anhydrous ceric sulfate substituted for the tetrahydrate at 10g/l and sodium bisulfate substituted for sulfuric acid at 50g/l (Bowler, Clerc). With actual usage, the solution becomes cloudy, with residue slowly settling, and its removal by decantation or by filtration previous to subsequent usage. Substitution of ceric ammonium sulfate for ceric sulfate at an equivalent concentration of 20g/l produced less satisfactory results, with weaker blue and brown tones. In initial experiments with exposed Kodak T-Max 100 film, bleach removal of silver negative image was quite slow - in excess of 20 minutes reaction time, resulting from slow redox kinetics, as compared to 5 minutes or less for permanganate or for dichromate bleach. To speed up bleaching, following the work of Shibaoka and Hayashi, use of a first developer stop bath of acetic acid containing a small amount of catalyst such as thiourea (see below), considerably enhanced bleaching kinetics, but even at 10 minutes left a noticeably visible negative image, which did not interfere significantly with appearance of the positive. Unexpectedly, it was discovered that no second exposure was required to give satisfactory diapositives, in marked contrast to permanganate or to dichromate bleaching. An explanation for this behavior is that thiourea survived the cerate bleach and produced a modified Waterhouse Effect in the second developer, where formation of silver sulfide initiated development without second light exposure (see Discussion). 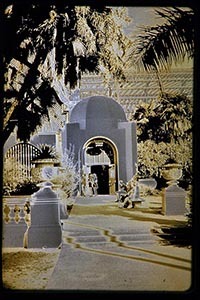 Results from the above table, depending upon the degree of object luminance, are the combination of three separate processes, normal reversal, re-reversal, and the Waterhouse “thiourea blue” effect. This complex mechanism brings to mind Marshall McLuhan's comment on “startling changes resulting from new hybrids and crossings of media” (Yurow 2011). 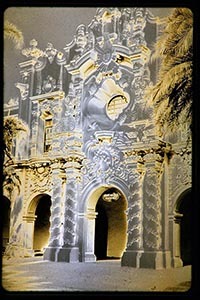 Of unusual visual appearance, high luminance objects in sunlight often posses a “spectral” quality, especially with structures having ornate facades. With regard to a visual comparison of the two equidensity procedures of interest , the Waterhouse technique frequently has an overall transmission of 5-7% and can be considered as dark (Milner) and more usually resembles a negative, while the cerate rendition in this study often results in a slide with approximately 20% transmission (brilliant) and is more like a positive. In connection with high luminance landscape objects, a number of photometric values have appeared in the literature (Adams, Encyclopedia of Colour Photography, James, Mack & Martin, Mees), and are given in the table below. Values reported in candles/ft. square have been converted to the metric value of millilamberts by a 3.38 multiplication factor. These subjects translate into lighter shades of blue as luminance values decrease, through off-white, and eventually into brown tones. Most of the above in open shade (ca ¼ of the luminance in sunlight) will reproduce as off-white or tan to medium brown, while if in deep shade, will appear as dark brown. Some of the former may exhibit re-reversal, i.e. giving flat, featureless and grainy moderate luminance areas, which are quite noticeable, e,g., tree canopies, unpainted aged wood. Applicability of the cerate bleach re-reversal technique to esthetically pleasing landscape photography requires considerable visualization (Adams). 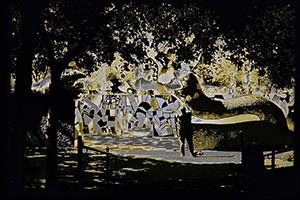 Although this method usually favors “high key” landscape renditions, significant shadow areas (dark brown) should be present to give balance to the image. High luminance objects in sunlight, with intricate surfaces casting local shadow areas, illuminated only by skylight, such as sculptures or building facades, can give the diapositives a novel appearance, exhibiting a blue tone with a myriad of fine white contour lines. When blue areas border brown areas, contour lines result from lateral diffusion of inhibiting bromide ion. In Munsell color terms, shadows are rendered as ISCC-NBS color #47 – dark grayish red Brown, and highlights as ISCC-NBS #185 Blue (Manual). The actual reversal process used for T-Max 100, following a sunlit outdoor exposure with a Wratten #25 red filter of 1/125sec at f5.6, is as follows at 20-22 C.
Discussion: The elimination of any second exposure requirement with cerate bleach in the reversal process, which simplifies the procedure, is explained as follows. Assume, as also the case with dichromate bleaching, that the elimination of the sensitivity specks at the surface of the still unexposed silver halide crystals makes them almost insensitive to light (Kowaliski). Here, the Waterhouse effect comes into play, when thiourea with residual silver bromide forms silver sulfide in the second developer's basic solution to give silver sulfide specks which can act as developer initiators without the need of light (Yurow 2000). For this reaction to occur, it is required that thiourea or its silver bromide-thiourea complex survive in significant amounts attack by the oxidizing cerate bleach. This result seems plausible, because of the relatively slow oxidation kinetics of cerate ion as compared to those for permanganate and dichromate. In this connection, it was found that with too short a cerate bleach, i.e., 5 minutes, the significant amount of remaining negative image results in high fog and a dense diapositive. Conversely, too long a bleaching period , i.e., 15 minutes, oxidizes most of the thiourea complex, resulting in a brown diapositive lacking those blue highlights characteristic of the Waterhouse Effect (Yurow 2000). Consequently, 10 minutes bleaching time appears to be optimum. A batch of cerate bleach on second use, as compared to a freshly prepared sample, gives considerably deeper blue highlights, which may be related to the the significantly higher concentration of cerous ion present, which would slow oxidation kinetics. As regards outdoor first exposure, tonal results will vary considerably in the range 1/125 sec at f4, f5.6 and f8. Longer exposures will give a predominance of blue highlights over brown middle tones and shadows, while with shorter exposures, the opposite is true. 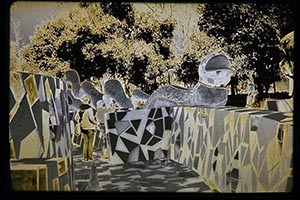 Reversal processing of B&W slides with permanganate or dichromate bleach with insufficient second exposure can result in re-reversal, with shadows appearing as flat and granular as a result of differential desensitization. With cerate bleach, the object of this investigation, Waterhouse reversal is involved, with elimination of a second exposure requirement. With the customary Waterhouse reversal (Yurow 2000), only one developer, containing thiourea and the absence of any potassium bromide, is involved. Waterhouse reversal in conjunction with cerate bleaching involves the presence of thiourea in the stop bath after first development to catalyze the bleaching step, some of which carries over into a second developer which does contain potassium bromide. The result here is re-reversal of middle tones that reproduce as flat and granular. While the appearance of slides with customary Waterhouse are often dense and low key, for those with the cerate procedure, high key renditions frequently predominate. Although the mechanism of the former is well known, that for the latter seems to be complicated and will require further investigation. Middle tone re-reversals with cerate bleach and thiourea catalyst, are pictorially reminiscent of the tone separation process of Alfred Person. In brief, this latter technique involves preparation from an original negative of both specially processed intermediate positive and second negative, with subsequent printing in register of the two negatives. Here the results are images with striking middle tones that are flat and quite grainy, and are characterized by an unusual so-called “Z”shaped tone separation sensitometric curve (Romer, Kowaliski). With the current work, these flat areas can often be found in images of outer leaves of tree canopies, unpainted wood areas in open shade, etc. Adams, A. Natural-Light Photography, pp 18-19, Morgan & Morgan, Hastings-On-Hudson 1971. Adams, A., The Negative, pp 1-7, Little, Brown, Boston 1981. Bowler, S.W., “Simplified Reversal”, British Journal Photographic Almanac 1956, pp 149-155, Greenwood, London. Capstaff, J.G., “Controlled Reversal of 16mm Motion Picture Film” U.S. Patent 1,460,703, 3 July 1923. Clerc, L.P., Photography: Theory and Practice, 2nd Edition, pp 246, 303, Pitman, New York 1940. Encyclopedia of Colour Photography, M. Deribere, editor, p 68, Fountain Press, London 1962. Glafkides, P., Photographic Chemistry, p 174, Fountain, London 1958. Haist, G., Modern Photographic Processing, p 327, McGraw Hill, New York 1975. James, T.H. And Higgins, G.C., Fundamentals of Photographic Theory, pp 238-239, Morgan & Morgan, New York 1960. Jones, B.E., Encyclopedia of Photography, p 99, Arno, New York 1974. Kodak, Q-2DR,“Ceric Sulfate Dot-Etching Solution R-20”, Rochester, New York 1977. Kolthoff, I.M. And Sandell, I.B., Textbook of Quantitative Inorganic Analysis, Revised Edition, pp 583, 611 -613, MacMillan, New York 1949. Kowaliski, P., Applied Photographic Theory, pp 100, 476, Wiley, London, 1972. Lea, H., “Cerium Peroxide Reducer”, The Practical Photographer, 1, 13-14 (1904), Google Books. Lumiere, A. & Lumiere, L., and Seyewetz, A., “Quinone Compounds as Reducers of Silver Images”, British Journal of Photography, 57, 625-626 (1910). Google Books. Mack, J.E. And Martin, M.J., The Photographic Process, p 25, McGraw Hill, New York 1949. Manual of Color Aerial Photography, ISCC-NBS Centroid Color Chips J. T. Smith Jr. editor, American Society of Photogrammetry, Falls Church, Virginia 1968. Marsh, J.K., “Reduction with Cerium Peroxide”, Wilson's Photographic Magazine, 46, 303-304 (1909). Google Books. Mees, C.E.K., The Theory of the Photographic Process, 1st Edition, pp 109, 544-546, 769-772, MacMillan, New York 1945. Mees, C.E.K., The Theory of the Photographic Process, 4th Edition, T.R. James editor, p 449, MacMillan, New York 1977. NIIR Board, Handbook on Printing Technology, 2nd edition rev., p 226, Asia Pacific Business Press, Delhi, 2011. Google Books Internet reference. Paulenova, A., Creager, S.D., Navratil, J.D., Wei, Y., “Redox Potentials and Kinetics of the Ce3+/Ce4+ Redox Reaction and Solubility of Cerium Sulfates in Sulfuric Acid”, Journal of Power Sources, 109, 431-438 (2002). Printout available from the Internet. Person, A., Bildmassige Leica-Photos durch Tontrennung, H. Bechhold, Frankfurt a,M., 1935. Romer, W., “Isohelie and Tone Separation”, The Photographic Journal, 98B, 247-251 (1958). Salzberg, H.W., Knoetgen, H., Moilles, A.M., “Rate of Solution of Silver in Aqueous Ceric Sulfate Solutions”, Journal of the Electrochemical Society, 98, 31 (1951). Seyewetz, A., “Ceric Sulfate Bleach for Hardening Effect in Warm Weather”, Photographie, 16, 528 (1929). Seyewetz, A., “ Reactions Produits dans les divers Procedes de Dissolution de l'Image Argentique”, Revue Francais Photographique, 10, 365 (1929). Shibaoka, H. and Hayashi, K., “Reversal Processing Methods for Black and White Photographic Light-Sensitive Materials”, U.S. Patent 4,322,493, March 30, 1982. Verkinderen, I.H., “Reversal Processing”, British Kinematography, 13, 37-45 (1948). Waterhouse, J., “On the Reversal of Negative Photographic Images by Thio-Carbamide”, British Journal of Photography, 37, 601 (1903). Yurow, H.W., “Developer for the Direct Production of Equidensity Images on a High Contrast Film”, U.S. Patent 6,083,671, July 4, 2000. Yurow, H.W., “Whither Analog Photography?-A McLuhanesque Approach” . unblinkingeye.com Feb. 2011. Yurow, H.W., “An Investigation of Permanganate Bleach Re-Reversal”. unblinkingeye.com August 2014. Yurow, H.W., “Selective Reversal – A New Path to Photo Abstraction” unblinkingeye.com April 2016.